ETS2/ATS Local Radio plays radio from where you are, in ETS2. Feel the immersion when the Swedish radio plays in Sweden, and the Polish radio in Poland. It will switch automatically, while also allowing you to switch stations while driving. You can switch using the web interface, your keyboard, your controller and your mobile phone. ATS/ETS2 Local Radio contains over 3000 radio stations that you could realistically listen to if you were driving in that actual country. Most national radio stations are included; see the full list at the bottom of this page. It does not include radio stations that you would not be able to receive over FM or DAB in that country, like TruckersFM. However, you can add those yourself if you so desire. ETS2: Default, Going East, Scandinavia, France, Italy, ProMods, RusMap, Southern Region, TruckSim Map, Project Balkans, Egypt Add-on, YKS Turkey, Russian Open Spaces, YKSRSK, Romania Extended, The Great Steppe, AfroMap and Italy Map. ATS: California, Nevada, Arizona, New Mexico, Viva Mexico, Coast to Coast, Canadream. It's available in over 20 languages! Click the "Install plugin for Euro Truck Simulator/American Truck Simulator" button. 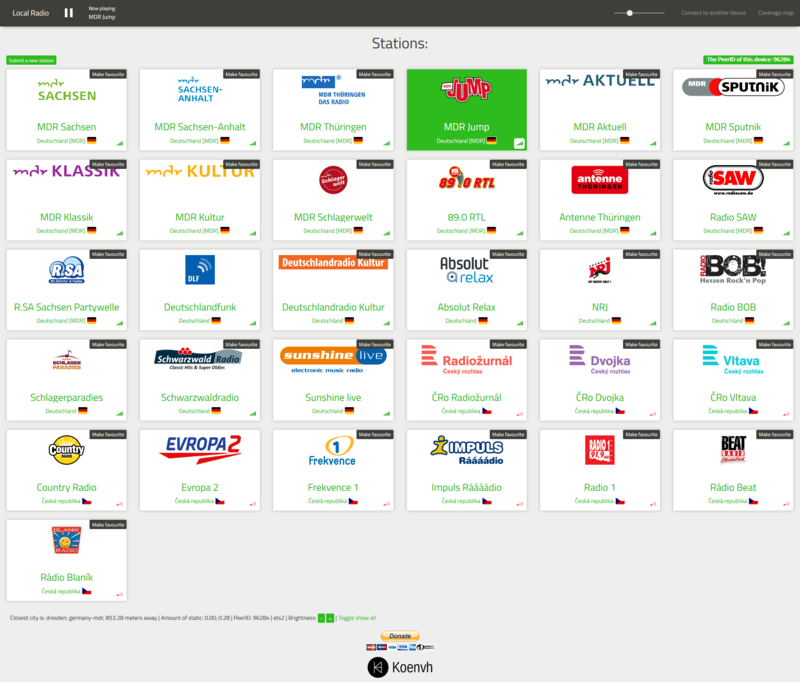 Open ATS/ETS2 Local Radio (or go to http://localhost:8330) and have fun. Additionally, you may want to look at the web/config.js file and set some additional settings to make the make your experience even better. Please make sure that the keys and buttons you assign in ETS2 Local Radio are not assigned in game as well. Make a station favourite to always switch to that station when entering the country it's located in. Found a station that does not work, a wrong (or incomplete) translation or something else? Please open an issue or post it on the ProMods/SCS forum. Suggestions are welcome as well of course. Make sure to read the troubleshoot section beforehand! Every city acts as a transmission tower with a certain range, and every city is bound to a country. The program check the distance to every city, and when it is within reach, the stations for that country are displayed. When a city from a different country is closer than the one currently connected to (with a threshold), the radio automatically switches to that country. What does that coverage map show? It shows all the transmission towers (the cities), with a range circle. The black inner ring is the clear audio border (~20% static). Each country has its own (random) colour, to make it easier to see the difference between them. What is the PeerID and what does it do? / Can I use my phone/tablet to control the radio? The PeerID is an ID that identifies that instance of ATS/ETS2 Local Radio. It allows you to control Local Radio from another device, like a phone or tablet. Simply go to the URL shown in the server on your phone or tablet, click "Connect to another device", enter your computer's PeerID and you're ready to go. All input on your second device will be redirected to your computer. Once you enter a different country, the radio will automatically switch to a station from that country. Normally this is the first available station, but if you set a station as your favourite, that station will be played instead. You can also quickly switch to that station if you assign a key/button to the "Switch to favourite" option. Can I add my own stations? Yes you can! Just head over to the submit station page. If it is accepted, it will be added in the next update. However, maybe your station does not meet the criteria (web only, does not broadcast in the majority of a country), but you still want to add it. That's possible too. Just go to the \web\stations\stations-custom.example.js file, rename it to stations-custom.js and add your own stations there. More information on that can be found in that file as well. Why does it have to broadcast in a majority of the country? Imagine a radio station that has a range of 50km in real life (which is quite a lot), so a diameter of 100km. Now, ETS2 has a scale of 1:19, so that would be 5.26km in ETS2. If you drive at 80km/h, you'll be able to listen to it for 0.066 hours or about four minutes, which is less than the time of one song. And that's when you go right through the middle of the coverage circle, it will be even shorter if you don't. You can already see (or actually hear) this problem by driving through Luxembourg, as Luxembourg is quite a small country. The problem you create then is that the radio constantly switches stations, which is not really desirable. I worked around this in ATS, where radio stations are licensed per city instead of per state, by making the range unrealistically large and making it switch later than in ETS2, but the problem still exists there too. Can you support map x? Maybe, maybe not. You can always send in a request. ATS maps will not be added unless you provide at least one station per new city. ETS2 maps will not be added unless you provide at least one station per new country. If you provide the cities and stations, then I will add them. For getting the cities, see https://github.com/Koenvh1/ETS2-City-Coordinate-Retriever/blob/master/README.md, for the stations, see the custom stations example file for the format. How about Project Balkans, Open Spaces, Coast to Coast or YKS Turkey? A persisting problem is that some maps are incompatible with each other. For that reason, some custom maps are not enabled by default. You may want to edit the \web\cities\cities-ets2.js file, scroll to the bottom and uncomment the lines for Project Balkans, YKS Turkey and/or Open Spaces. Edit the \web\cities\cities-ats.js file, scroll to the bottom and uncomment the lines for the map to enable it. 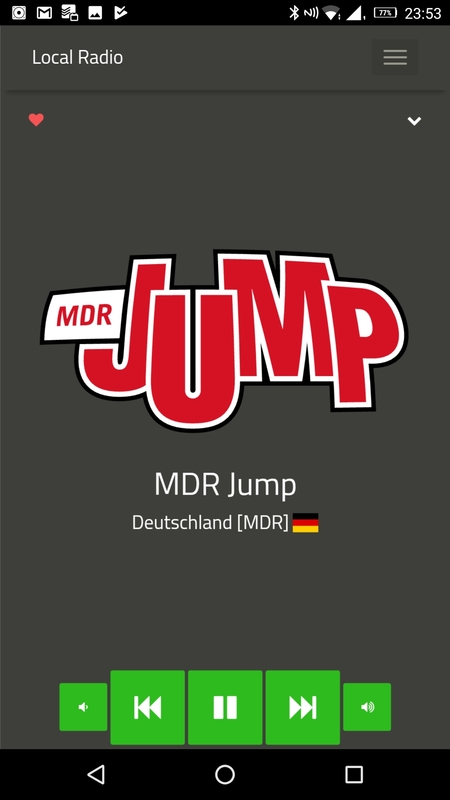 This will reset when you update ETS2 Local Radio. Why do Chrome, Opera, Internet Explorer and others not work fully? You can see why I recommend Firefox or Edge. I have considered using VLC for the playback, but the CPU usage for HLS streams would regularly exceed 30%, something I don't consider acceptable. Over time stations will probably fix their playback for Chrome and Opera, but I can't do it for them. Update 2017-04-24: It seems like most stations have fixed their playback for Chrome and Opera now. Update 2017-06-26: Actually, Chrome and Opera made an exception for ShoutCast. Still works though. What is this program called? It was called ETS2 Local Radio initially, with Local Radio being the short form. Then support for ATS came. To make clear that it also supports ATS, I started using the name ATS/ETS2 Local Radio, ETS2/ATS Local Radio, Local Radio for ATS/ETS2 etc etc. Generally speaking, I use ETS2 Local Radio, but I'm not really consistent when it comes to naming. The game crashes on exit! Please bear in mind that it is experimental, so it may crash your game, kill your kittens or destroy the universe. Try restarting ATS/ETS2 Local Radio server. Please make sure your firewall is not blocking the connection. If you use a different firewall that Windows Firewall, then please allow incoming connections on port 8330. You can test whether the firewall is the issue by going to http://localhost:8330, if that works, it is most likely a firewall issue. Add ATS/ETS2 Local Radio server and/or incoming port 8330 (TCP) to the exceptions list (consult your firewall's manual how to do that), or just use http://localhost:8330. If it does not work on localhost either, then please try changing the default port in the settings.json file. Try refreshing the webpage. Make sure you're using a modern web browser (preferably Firefox, Chrome or Opera) and your firewall does not block the connection. It says the simulator is not running even though it is! Some systems/graphics cards may have this issue. Please try removing the plugin by clicking "Remove plugin", then change your graphics settings and install the plugin again. There is as of yet no solution for this problem, and I very much doubt that there ever will be given that DirectX 9 is very picky and this problem affects very few people. Just uninstall the overlay before starting the editor. Close the server, open the settings.json file, and change vr to true. Make sure that Microsoft Visual C++ 2010 Redistributable Package (x86) is installed. Something else does not work! 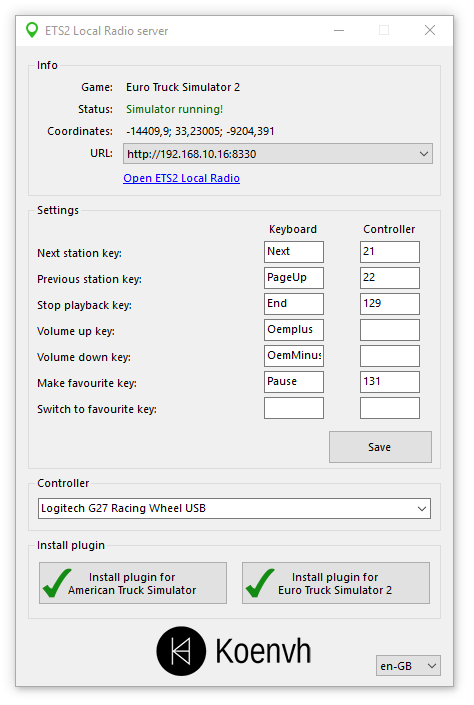 Try restarting ETS2/ATS, rebooting your PC, and reloading the ETS2 Local Radio web page (as your browser may still have an invalid cached version of the page). If that does not work, then please open an issue or post it on the ProMods/SCS forum. Include the Error log.txt file if possible. Why is the code such a mess? Call it "organically grown". Initially, this project was a skin for ETS2 Telemetry Server. Later it got its own server. That, combined with the fact that I never intended this project to become this large, is why the code is shoddy in some places. I have started refactoring the code, but I honestly can't really be bothered to finish that. Maybe some other time.